A firm has just entered the final stages of the Dyson Awards thanks to this visor with lights and inbuilt indicators. Blink hopes to increase rider safety by making the indicators more visible than usual, and by ‘humanising’ the rider thanks to a small light which illuminates the rider’s face. The helmet visor looks to solve two problems; firstly, it helps make the rider and their intentions more visible. Some times with bikes the leaning angle obscures the indicators which makes it hard for other motorists to see you at a glance. The visor indicators are less likely to be obscured and they add another set to the bike. Secondly, it helps to humanise the rider, bikers don’t always have the best reputation with car drivers, which makes it easy for them to be seen as a faceless group, particularly since all the safety gear obscures the person. This visor slightly illuminates the riders face helping to remind drivers that it is a real person riding the bike. 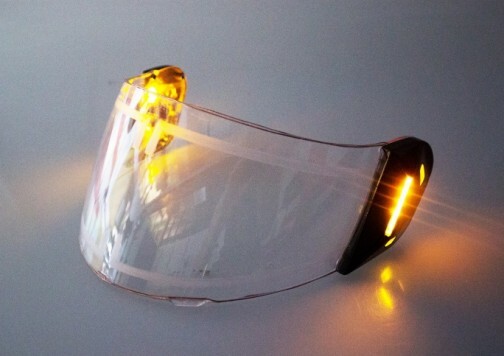 The helmet visor gives the motorcyclists a third more visible set of indicators which wirelessly connect and integrate with the existing motorcycle indicator electronics. The indicator controller sends a signal that sensors in the visor pick up telling it when to indicate. It allows more light to shine from the motorcycle improving the visibility of the rider and making them more eye catching. The design is aimed at sports bike riders so will easily fit into that market. This product is compatible with many helmets. This entry was posted in Blog and tagged 59 club, led turn signals, modern technology, motorcycle news, safety Crash helmet, ton up safety visor, Visor. Antique Nationals at Fontana was a Blast to watch and be a part of. HAPPY INDEPENDENCE DAY EVERYONE !